Will Mubarak News Further Delay Democracy? : The Two-Way Some Egyptians fear the military is going to further "bamboozle the democratic process," NPR's Soraya Sarhaddi Nelson reports. The concern: Generals will cite Mubarak's declining health — or death if that happens — as a reason to put off reforms. Will Egypt's Generals Use News About Mubarak To Further Delay Democracy? 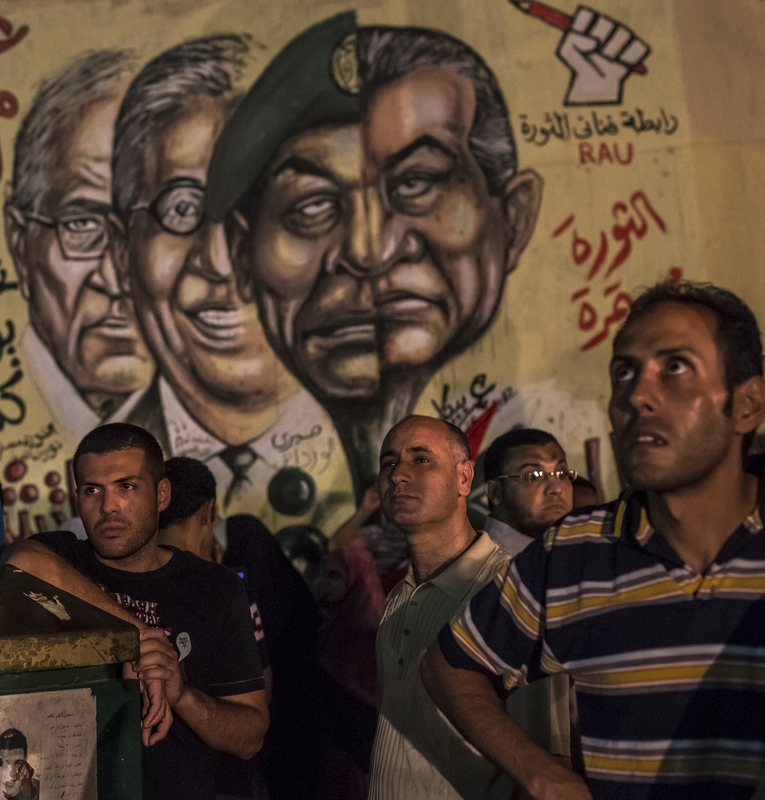 In Cairo's Tahrir Square on Tuesday night, men gathered in front of graffiti showing ousted President Hosni Mubarak and others from his regime. -- Many Egyptians who have gathered there are saying, "It's about time, let him go." -- But many others are wondering whether the generals who wield power in Egypt will use the news about Mubarak to further delay the country's already stuttering steps toward democracy — "to bamboozle the democratic process" even more, Soraya said on Morning Edition. Mubarak is serving a life sentence for not stopping the killing of protesters during last year's Arab Spring uprising in Egypt. Now, "there is a lot of concern that the news [about Mubarak] is being used to ... continue delaying declaring a victor and dealing with the issue of having to dissolve parliament," Soraya says. As for Mubarak, a key word to watch for in all reports about his condition is "reportedly." All information is being tightly controlled by those loyal to the ruling generals. Finding out for sure what's going on is virtually impossible. -- "Hosni Mubarak, the deposed Egyptian leader, has been revived and is on an artificial respirator after he suffered stroke, sources in the interior ministry and from his family told Al Jazeera." We'll keep an eye on the news from Egypt and pass along highlights. Update at 3:05 p.m. ET. No Results Thursday, Officials Say. "Egypt's elections authorities say announcement of the winner of Egypt's presidential election will be delayed but gave no new date. The Supreme Elections Commission says in a statement Wednesday that results won't be announced on Thursday as scheduled because it is looking into complaints presented by rival candidates. "A panel of judges has to look into some 400 complaints over voting submitted by both Ahmed Shafiq, ousted leader Hosni Mubarak's prime minister, and the Muslim Brotehrhood's candidate Mohammed Morsi's campaign."